The Ministry of Transport has withdrawn 2 illegal documents in the sale of shares in Quy Nhon port. At the Government press conference in the afternoon of March 1, Mr. Bui Ngoc Lam - Deputy General Inspector of the Government said that the conclusion of inspection in the sale of Quy Nhon port is being urgently carried out by relevant agencies. A few days ago, Deputy Prime Minister Truong Hoa Binh chaired the meeting with relevant ministries and agencies to hear reports of implementation results and difficulties in the process of implementing conclusions on inspection of wrongful equitization in these units. The Ministry of Transport has withdrawn 2 previous documents which are not in accordance with the state regulations on equitization of Quy Nhon port. In addition, the Ministry has directed Vietnam National Shipping Lines (Vinalines) to directly work with representatives with shareholders at Quy Nhon Port Joint Stock Company. "The parties have basically agreed to carry out the procedures for re-transferring more than 75.01% of the shares previously and withdrawn to the State. This company has prepared financially, ready to pay. the money that shareholders paid to Vinalines ... ", Mr. Lam informed. Besides, the Ministry and Vinalines also carried out legal procedures to re-register shares and transfer to the State for holding. "The Deputy Prime Minister has directed the Ministry of Transport to preside over Vinalines soon to receive and manage 75.01% of shares in accordance with the provisions of the law. The ministries focus on considering and removing problems difficulties in the process of implementing inspection conclusions, ensuring urgency, transparency and compliance with regulations ", Deputy Inspector General said. Quy Nhon Port was established in early 1976, managed directly by the Maritime Department. At the end of 2009, the Ministry of Transport transferred this port from the Maritime Department to Vinalines. This enterprise then moved the port of Quy Nhon into one-member limited liability company, independent accounting, which is a subsidiary of Vinalines (Vinalines holds 100 chartered capital). In 2013, the company converted its operation model to a joint stock company, with the name Quy Nhon Port Joint Stock Company. Charter capital is more than VND 404 billion, of which Vinalines holds 75.1%, the remaining shareholders hold 24.9%. According to Government inspection conclusions here, the agency has discovered many serious violations in the equitization process of Quy Nhon port. Specifically, the Ministry of Transport illegally sold State shares at this unit. The Government Inspector proposed to assign the Ministry of Transport to preside over and recover 75% of the shares in Quy Nhon port, which was allowed by the Ministry to transfer to Hop Thanh Company. 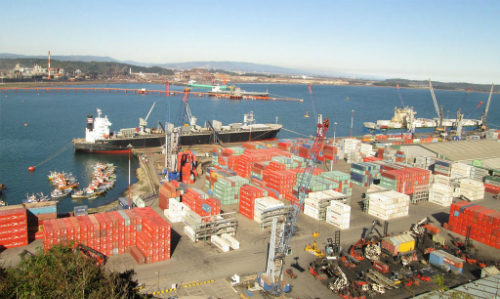 Quy Nhon port is one of the national general ports, regional hubs (type 1) of the South Central seaport group with a system of 20,960 warehouses, 12,000 m3 of yards, 48,000 m2 of container yards, on 306,568 m2 of premises. The port has 6 piers with a total length of 824 m, can receive ships of 30,000 DWT with normal frequency. Cargo throughput in 2015 was 7.5 million tons.